Review by AllTheBestFights.com: 2015-11-21, fight not particularly good between Enrique Barzola and Horacio Gutierrez: it gets two stars. Enrique Barzola entered this fight with a record of 10-2-1 (80% finishing rate) while his opponent, Horacio Gutierrez, has an official record of 2-1-0 (100% finishing rate). 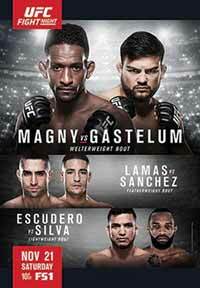 Barzola vs Gutierrez is the lightweight final of “The Ultimate Fighter: Latin America 2 Finale”; undercard of Neil Magny vs Kelvin Gastelum – UFC Fight Night 78. Watch the video and rate this fight!